The Business Gateway growth hub connects businesses to many different providers of business support services. Below is a selection of case studies for businesses that we have supported with our business support partners. Get in touch today to discover how we can support your business growth, whatever your challenge. Call 0116 366 8487 or email growthhub@bizgateway.org.uk and we’ll be in touch as soon as we can. Hear from Darren Woolley who approached the Business Gateway looking for training support and funding opportunities to expand and grow his business. A Gateway adviser signposted him to funding from iNet and Manufacturing Growth Programme that enabled him to move into bigger premises and expand his team. Hear from Melanie Mee and Michele McDonald from Pyrotect who approached the Business Gateway for advice on marketing strategy and funding options to take their business to the next level. They attended a Business Gateway workshop with Lindsey Newman-Wood of Passion Marketing and an adviser signposted them to NBV for financial support. Hear from mother and son Mauli and Ash Shah of World Products Ltd who approached the Business Gateway for advice on growing their e-commerce business. They met with an adviser who signposted them to a number of apprenticeship schemes and opened new doors and opportunities for the business. Hear from Vikki O’Hara who approached the Business Gateway for advice and support with her new business. Vikki met with an adviser and was able to discuss the best pathway to recruiting, manufacturing new products and general business support. Hear from David Martin who approached the Business Gateway for advice to accelerate the growth of his hand and machine tool business. David met with an adviser who signposted him to a number of networking circles which opened new doors and opportunities for his business. Hear from Gail Brown who approached the Business Gateway for advice on funding to accelerate the launch of her coffee shop in Leicester. Gail met with an adviser and was signposted to a number of finance options, including NBV and Green BELLE. Hear from Learie Gonsalves who approached the Business Gateway looking for advice and support to set up his business. Hear from Sandra Wiggins who approached the Business Gateway for advice on funding to accelerate the growth of her light box business. Sandra met with an adviser and was successful with funding applications totalling nearly £20,000, as well as upskilling her work force. 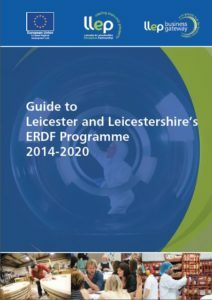 This guide includes information on how the European Regional Development Fund has been invested in the county, the successes of some of the business support providers we work with, and case studies of business growth in the region. Peppercorn Catering wanted support and expertise in planning and growing a business, to help them focus on expanding each division and adding new income streams. Bluefrog design wanted help to grow the business and focus on new markets. They met with a Business Gateway adviser who was able to help them set a strategy for growth. DPI (UK) Ltd wanted funding and to grow their business. They met with a Business Gateway adviser who helped direct them to available funding to meet their needs. Gillian Coleman joined the Zinthya Trust and wanted to develop her leadership and management skills. She was offered free training to develop the skills needed for her new role.